The Farjo Hair Institute was a real talking point for the nation once again this week, as former England player, David Platt, revealed that he had had a hair transplant with a twist. The ex-Manchester City assistant manager underwent a robotic FUE surgeryat our Manchester clinic. The procedure was carried out by myself and the team – however, we were also accompanied by the ARTAS Robotic System. 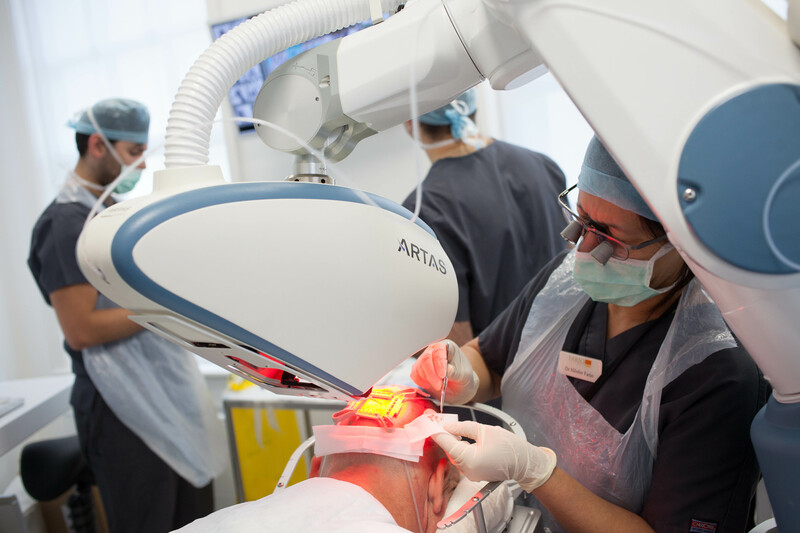 His robot-assisted surgery was covered in both the Metro and the Daily Mirror, and our very own Dr Greg Williams appeared on the radio talking about ARTAS and how it works. For those of you who missed it, this state-of-the-art system allows hair restoration surgeons to harvest donor hair follicles by the FUE method with extreme precision and minimal invasion. It works by automatically photo-mapping the donor hair area to identify the most densely populated sections of hair. It then harvests grafts of hair which the surgeon and his/her team manually transplant to the recipient area. The robot at Farjo’s Manchester clinic is one of only three in Europe, allowing our patients access to cutting edge technology. When operated correctly and expertly, the ARTAS robot harvests top quality hair grafts helping to achieve the most natural looking end result and no linear scar. David was the latest in a string of patients – albeit the most well-known – choosing this type of treatment. He researched the topic of hair transplantation for several months, before deciding to have his procedure performed by robot after hearing about the benefits of the procedure. His procedure involved having 2,200 grafts of hair microscopically harvested from the back and sides if the scalp by intelligent robotic software, the ARTAS system, then transplanting them by the surgical team to the front of his scalp. As with all hair transplant surgeries, it will take around six to 12 months before David’s new hairline is clear to see – so watch this space!